Blu-ray will be knee deep in murder, mayhem, and manipulation this June. 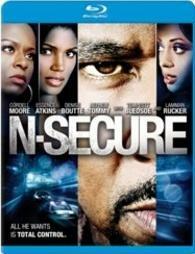 In an early announcement to retailers, 20th Century Fox has set 'N-Secure' for high-definition on June 14. This no-holds-barred drama has become a cult favorite and features a star-studded cast headlined by Cordell Moore ('Diary of a Mad Black Woman'), Essence Atkins ('Are We There Yet? '), Denise Boutte ('Meet the Browns'), and Lamman Rucker ('Why Did I Get Married Too'). Supporting cast includes NAACP® Image Award nominee Elise Neal ('Hustle and Flow'), Tempestt Bledsoe (“The Cosby Show”), BernNadette Stanis (“Good Times”), and Thomas ‘Nephew Tommy’ Miles (“The Steve Harvey Morning Show”). The Blu-ray will feature 1080p video, a DTS-HD Master Audio 5.1 soundtrack, and the only supplement is Inside N-Secure. You can find the latest specs for 'N-Secure' linked from our Blu-ray Release Schedule, where it's indexed under June 14.